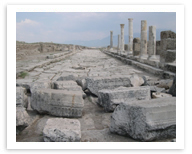 Once home to a large Jewish community, Laodicea quickly acquired a significant Christian population as well, and is singled out in the New Testament as one of the Seven Churches of the Revelation. In his letter to them, speaking on behalf of Jesus, John counsels the Laodiceans to “be zealous and repent.” The city was fairly large, and fairly rich- large enough to have two theatres, and rich enough to feel themselves, according to John, “in need of nothing.” The ruins here are more widely spread out than at some other sites, so it’s helpful to have some transportation, otherwise you may be in for a bit of a trek. The principal reason for coming here, though there are ruins to be seen, is Biblical, and for real ruins-watchers, those in nearby towns of Hieropolis and Aphrodisias are both a bit more impressive, and more accessible, though certainly with different historical contexts.